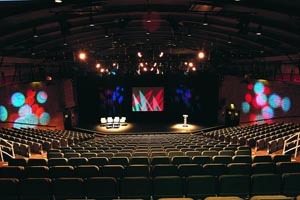 The Mermaid Conference & Events Centre has had a permanent wi-fi system installed, giving delegates who attend its events better connectivity. The kit has been supplied and fitted by event technology specialist Max Wifi, which has just launched its Venue Wifi Service. The Mermaid now boasts a Meraki MX70 router and 25 Meraki MR16 dual radio access points and can offer connectivity to devices which communicate on 2.4Ghz and 5Ghz radio frequencies. The system can also be augmented to suit clients' needs to provide up to 100mb of bandwidth. Richard Hughes, Max Wifi’s managing director, said: "We have created this service in response to market demand. It means that fixed venues can now tap into decent secured connectivity and offer their clients a fail-safe wi-fi solution. "There is a running cost to maintain the connection but it doesn’t have to run at full speed all the time. With demand increasing and the Olympics next year, venues will need to up their game if they’re looking to remain relevant in today’s demanding events and conference market."